U.S. Marines and Sailors with Marine Medium Tiltrotor Squadron 161 descended on #NNSS for a training mission to conduct a noncombatant evacuation operation and mass casualty evacuation drill. The squadron is honing skills in rapid and emergency response in preparation for on-ship deployment with the 15th Marine Expeditionary Unit early next year. During the drill, MV-22B Ospreys inserted forces on an objective area at NNSS, verified identification of simulated noncombatants and casualties, and load them into the aircraft for evacuation. The drill was part of the squadron's overall deployment for training exercise at Creech Air Force Base, Nevada. 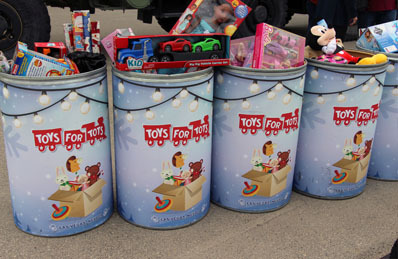 Employees of the NNSS collected hundreds of toys in support of the holiday Toys for Tots program. Santa’s elves are getting a little help this holiday season thanks to the employees at the Nevada National Security Site (NNSS). Employees in Southern Nevada are providing toys, clothes, and household items to thousands of children this holiday season. The efforts are part of NNSS employees’ annual giving campaigns. Adopting 176 “angels” from the Salvation Army’s Angel Tree program and Manch Elementary School, providing toys and bicycles to children. Employees donated 141 bicycles and 17 barrels overflowing with toys to Toys for Tots. Employees adopted 17 families at Kit Carson International Academy and through the Clark County Court system. Employees provided food, clothing, household items and toys for families in need. NNSS Fire and Rescue partnered with the Southern Nevada Burn Foundation to collect toys for more than 26,000 children here in Southern Nevada. 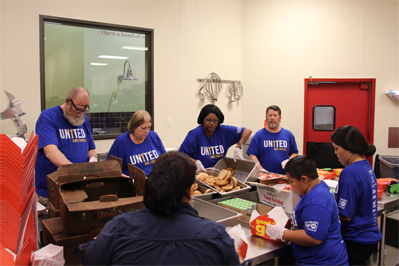 Employees provided 140 meals to the Las Vegas Rescue Mission. In addition to the gifts, employees have pledged over $249,000 to the United Way of Southern Nevada and the Combined Federal Campaign charitable giving campaigns. These donations benefit a variety of community organizations that serve those in need. Those efforts exceed last year’s pledges by more than $10,000. “It was heartwarming to see trucks overloaded with toys, bikes and clothing that will help needy families, and to see how generously employees are supporting local charitable organizations. 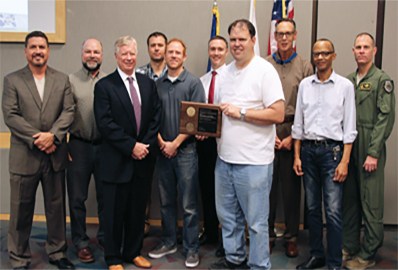 The holidays are about giving – and NNSS employees have shown how much they care about our community,” said Jim Holt, president of National Security Technologies (NSTec), the management and operating contractor for the NNSS. NSTec partners with federal employees from the Department of Energy and National Nuclear Security Administration; employees from Centerra-Nevada, the NNSS security contractor; and Navarro, the NNSS environmental contractor. Klotz heralded the work conducted at NNSA Nevada in cooperation with the National Labs, work he said is vital to nonproliferation. NNSA Administrator Lt. Gen. Frank G. Klotz (Ret.) 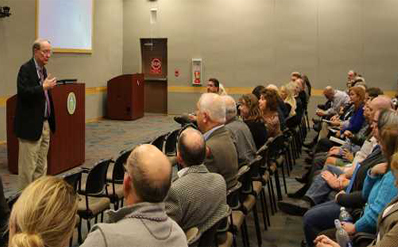 held an all-hands meeting at the NNSA’s Nevada National Security Site (NNSS) this week, praising employees for the work they do – and for maintaining a laser-like focus on mission and safety. Klotz highlighted the recent success at the Joint Actinide Shock Physics Experimental Research (JASPER) machine and the Source Physics Experiments (fifth & sixth) conducted this year. “Virtually everything of consequence that occurs in the nuclear security enterprise comes to or otherwise relies on the facilities and expertise at this site,” he said. 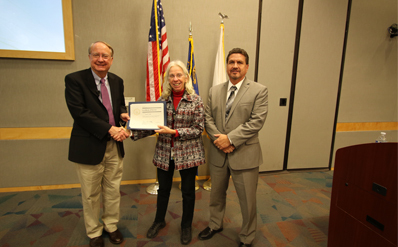 Klotz also recognized Nevada Field Office Deputy Manager Carol Sohn for her 20 years of service to DOE and NNSA. Klotz praised Sohn’s efforts in the field office and her work with Lawrence Livermore, Los Alamos, and Pacific Northwest national laboratories. 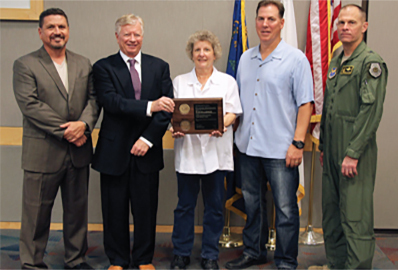 Klotz recognized Nevada Field Office Deputy Manager Carol Sohn for her 20 years of service to NNSA. In the U.S. Department of Homeland Security HS-STEM Program, undergraduates Molly Wolfson (left) and Sydney Shuk conducted research to improve detection and response. A highlight of the internship for both participants was a visit to the historical NNSS, where nuclear testing took place from 1951-1992. Clad in white HazMat suits, several individuals gather around an action plan drawn with dry-erase marker seconds before. The radiation detection devices in their hands suggest a sense of urgency: in this simulated event, the team is responding to a mock nuclear terrorist threat, and learning how to minimize radiation exposure is critically important. Their health, and lives, may one day depend on it. 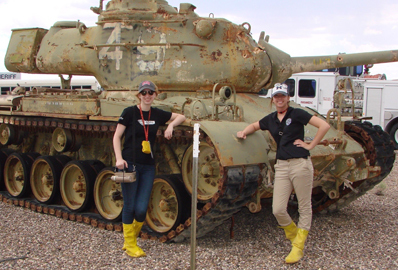 Sydney Shuk, a senior in microbiology at the University of Michigan, and Molly Wolfson, a junior in physics and mathematics from the University of Chicago, spent last summer in Las Vegas, Nevada, participating in training sessions like the one above and conducting research to ensure both the general public and emergency responders stay safe from radioactive contamination. As participants in the U.S. Department of Homeland Security (DHS) HS-STEM Program, Shuk interned at the Counterterrorism Operations Support (CTOS) Center for Radiological/Nuclear Training, and Wolfson interned at the Remote Sensing Laboratory (RSL) on Nellis Air Force Base. Both CTOS and RSL are managed and operated by National Security Technologies, LLC, which also manages and operates the Nevada National Security Site (NNSS). The DHS HS-STEM Program provides undergraduate and graduate students majoring in homeland security-related science, technology, engineering and mathematics (HS-STEM) disciplines the opportunity to conduct research in a DHS area at federal research facilities across the United States. Every year, the CTOS Center for Radiological/Nuclear Training prepares thousands of first responders such as public health officials, law enforcement and fire crews for their roles in preventing or responding to the deployment of radiological or nuclear materials. The center offers numerous training courses on radiological/nuclear awareness, radiation detection and nuclear response strategy. Attending these courses was a highlight of Shuk’s summer, and by the end of the summer she had successfully supported the development of an additional training course. Shuk’s time at the CTOS Center provided her the unique opportunity to help bridge the gap between biological and radiological workers. “I often hear radiation specialists talk of their fears of biological threats, and the biological specialists talk of their fears of radiological threats, but now I feel I can be the go-between for the two groups so we can all work together to find a common solution,” said Shuk, who researched under the mentorship of senior project manager Donald Van Etten. While Shuk collected these insights on radioactive contamination control, Wolfson conducted research on a tool that could be used by first responders to detect and differentiate between gamma and neutron radiation. These are two of the most powerful forms of radiation and are of serious concern to DHS. Gamma radiation can penetrate wood and aluminum; neutron radiation can penetrate lead and iron, but can be blocked by hydrogen-containing materials like concrete or water. Specifically, Wolfson helped characterize a type of sensor called a Cesium Lithium Yttrium Chloride (CLYC) detector. The CLYC sensor is incorporated into a handheld device that is gaining popularity as a possible replacement to currently utilized detector systems, which rely on elements like sodium iodide and helium-3 to detect radioactive neutrons. By the end of the summer, Wolfson confirmed that the CLYC detector can differentiate between gamma and neutron radiation. In addition, its elements—lithium and chlorine—facilitate neutron spectroscopy, a factor that allows for discrimination between different types of neutron sources. While both participants primarily researched independently, they shared lunch hours, breaktime strolls and field trips with other employees and interns from across the United States. Shuk and Wolfson particularly enjoyed this social, educational component of the program and the opportunity to visit historical federal facilities. A UNESE scientist records some measurement readings during the July 2016 radio-chemical tracer gas injection experiment at the Barnwell test bed in Area 20 of the NNSS. Scientists at the Nevada National Security Site (NNSS) are working on an experiment called the Underground Nuclear Explosion Signatures Experiment (UNESE) to improve the United States’ capability to detect and characterize suspicious underground nuclear testing by foreign states. The $35 million project, funded by the National Nuclear Security Administration (NNSA)’s Defense Nuclear Nonproliferation Research and Development Office of Proliferation Detection, investigates key signatures emanating from underground nuclear explosions over a broad range of time scales. UNESE is a collaborative research and development (R&D) project with National Security Technologies (NSTec), Los Alamos National Laboratory (LANL), Lawrence Livermore National Laboratory (LLNL), Pacific Northwest National Laboratory (PNNL) and Sandia National Laboratories (SNL). Its purpose is to better understand how the physical processes and features of the earth create, modify and transmit observable signatures that are particular to underground nuclear testing. Develop NNSS-based test beds to examine physics-based hypotheses and develop new modeling capabilities for UNE signatures in a variety of geologic settings, including analogs to sites outside the U.S.
Target the development of new and existing technologies for measuring near-field environmental signatures complementing and corroborating existing known long-range signatures. Attaining these objectives will allow the U.S. to improve capabilities to identify potential or suspected UNE sites, determine if a UNE has been conducted at a suspect site, and estimate key test characteristics (e.g., yield and depth). "The success of the UNESE project is a true demonstration of teamwork across the NNSS and the NNSA. Its impact on national security is quite relevant in today's world," said Melissa Hunt, NNSS Global Security director. UNESE may sound similar to the source physics experiments (SPE), also carried out at NNSS. Both strive to improve our ability to detect underground nuclear testing, but SPE is centered on monitoring for the prompt seismic and acoustic signatures of an underground nuclear explosion, while UNESE focuses on monitoring for the longer-term signatures. These include radioactive gas emissions, changes in the orientation of the magnetic field of the geologic materials close to the detonation point, alterations in surface topography, and stresses to flora and fauna. Scientists have been conducting experiments at the NNSS to study these post-detonation signatures since the 1993 Non-Proliferation Experiment, a chemical explosion that simulated a 1-kiloton underground nuclear detonation. There has been a significant uptake in interest in understanding UNE post-shot observables over the past five years, with predecessor projects to UNESE such as the Comprehensive Inspection Technologies and the Noble Gas Migration Experiment, both conducted at the NNSS. 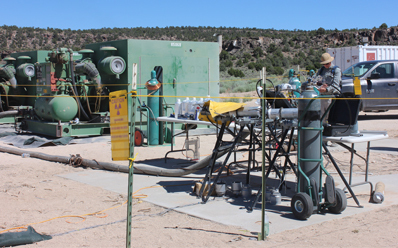 These efforts focused on radio-chemical gas transport from the UNE detonation point to the surface and other physical signatures at two legacy UNE locations on Pahute Mesa at the NNSS. In July 2016, UNESE completed an experiment where radioactive and chemical tracer gases were injected underground near the detonation point of the Barnwell legacy UNE test in Area 20 of the NNSS. Before tracer gas was injected, boreholes varying in depth from tens of feet to nearly 1,800 feet were drilled around the perimeter of the Barnwell shot and instrumented in various ways to monitor pressures and extract soil gas samples from the subsurface. Soil gas samples have been collected routinely for weeks and sent to LLNL and PNNL for analysis. Having completed all its planned experiments at the Pahute Mesa Area 20 surface test beds, UNESE is transitioning in fiscal years 2017 and 2018 to complete a suite of similar experiments in P-Tunnel near and around the Disko Elm legacy shot. By transitioning to a tunnel where legacy UNE testing was conducted, UNESE researchers hope to gain insight into how the post-shot observables and signatures are affected by the emplacement scenario and a different geologic setting. The ongoing successes of UNESE, its predecessor projects and its companion projects like SPE are vital in providing the necessary research and development to better understand the generation of key signatures associated with post-detonation nuclear testing. And, vital to our national security is the ability to monitor for and detect the proliferation of underground nuclear weapons testing, and verify compliance of nation states with certain nonproliferation treaties. Thousands of aviation enthusiasts visited the Nevada National Security Site (NNSS) exhibit at the Aviation Nation Air Show in Las Vegas over the Veterans Day weekend to learn more about the NNSS mission, especially the Remote Sensing Laboratory’s Aerial Measuring System (AMS). An estimated 135,000 visitors attended the event on Saturday, and were entertained by aviation demonstrations and acrobatics by the U.S. Air Force Thunderbirds and the Air Force’s newest fighter jet, the F-35 Lightning II. 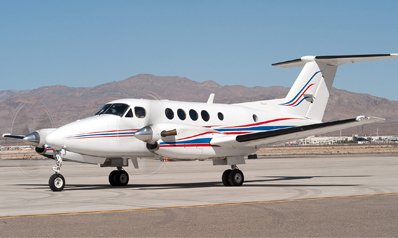 AMS Program representatives discussed their expertise in aerial measurement of radiation for emergency response and advanced surveys of major national and international events. NNSS Program representatives discussed other missions performed at the NNSS and its related facilities, including Stockpile Stewardship, Global Security and Environmental Management. 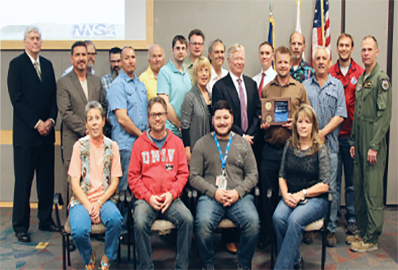 The National Nuclear Security Administration (NNSA) recently presented eight Nevada National Security Site (NNSS) teams with Defense Programs Awards of Excellence. NNSA Principal Assistant Deputy Administrator for Military Application Brigadier General Michael J. Lutton was on hand to congratulate the teams for their excellent work in support of the nation’s Stockpile Stewardship Program. The Next Generation Multiplexed Photonic Doppler Velocimetry Architecture Development Team’s nomination was also approved as an Exceptional Achievement. Exceptional Achievement acknowledges extraordinary accomplishments in the nuclear weapons life cycle process and is recognition reserved only for remarkable efforts, achievements and contributions made across the NNSA Nuclear Security Enterprise. 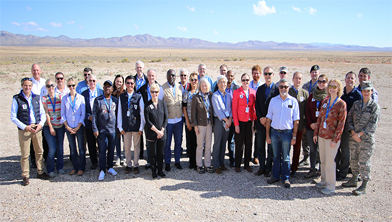 The Department of Energy’s National Nuclear Security Administration (DOE/NNSA) this week hosted diplomats from ten countries and two international organizations at the Nevada National Security Site (NNSS) and at the National Atomic Testing Museum (NATM) in Las Vegas, Nevada. The visit provided an up-close demonstration of NNSA’s science-based Stockpile Stewardship Program (SSP), through which the U.S. is able to maintain the safety, security, and reliability of its nuclear weapons stockpile without nuclear explosive testing. The tour also showcased NNSA expertise in applying world-class science, technology, and engineering to various nuclear security missions, including technical support for Comprehensive Nuclear-Test-Ban Treaty (CTBT) methodologies. NNSS—a former nuclear explosive test site until a moratorium on nuclear explosive testing was established in 1992—now serves as an experimental test bed and training ground for broad nonproliferation and national security missions beneficial to both the U.S. and the international community. We hope the diplomats visiting Nevada will come away with a better appreciation for our commitment to CTBT goals and objectives through the world-class science and technology at our national laboratories and here at NNSS,” said Brig. Gen. Michael Lutton, NNSA Principal Assistant Deputy Administrator for Military Application, who co-hosted the event. Visitors included Dr. Lassina Zerbo, Executive Secretary of the Preparatory Commission for the Comprehensive Nuclear-Test-Ban Treaty Organization (CTBTO PrepCom), and representatives of the United Nations Office for Disarmament Affairs. The delegation also included diplomats from Argentina, France, Indonesia, Nigeria, the Republic of Korea, Romania, Slovakia, South Africa, Switzerland, and the United Kingdom. In addition to NNSA’s Harrington and Lutton, the U.S. was represented by Ambassador Laura Holgate of the U.S. Mission to International Organizations in Vienna (UNVIE); Anita Friedt, Principal Deputy Assistant Secretary in the Department of State’s Bureau of Arms Control, Verification and Compliance; and Craig Campbell of the Department of Defense’s Office of Threat Reduction and Arms Control. Senior representatives from NNSS, Los Alamos National Laboratory, Lawrence Livermore National Laboratory, and Sandia National Laboratories also joined the visit and briefed the diplomats on the mission and contributions of the NNSA laboratories. Although the CTBT has not yet entered into force, it provides a framework for preparing to conduct on-site inspections to certify CTBT compliance and verify if a suspicious event was a nuclear explosion. The CTBTO PrepCom selects experts from partner states to lend their expertise as surrogate inspectors. Recently, a total of 80 international experts were chosen by the PrepCom to participate in the third on-site inspection training cycle as new trainees. Selected trainees will undergo a rigorous set of classes, workshops, and exercises to gain the skills required to conduct inspections. The United States fully supports the development of a robust on-site inspection capability. U.S. support to the CTBTO PrepCom most recently was demonstrated when NNSA hosted the Nevada Familiarization Activity at the NNSS in May 2016, involving 50 international on-site inspection experts from 32 countries. During this week’s tour, Harrington and Holgate announced that NNSA was offering to host additional training for surrogate inspector trainees at NNSS in October 2017. This effort will help trainees to identify anomalies or artifacts associated with locations where nuclear explosive testing has occurred. Based on evaluations by the Nevada Familiarization Activity participants, CTBT OSI training is most effectively conducted at an actual former nuclear explosive test site such as NNSS. NNSS is an unmatched resource for the CTBT on-site inspection trainees, and we are pleased to again allow access to one of the few places in the world where trainees can see firsthand the effects of past nuclear explosions,” said Harrington. The former test site is an excellent fit to develop our On-Site Inspection capabilities. The experience our future On-Site Inspectors can gain here is second to none,” Dr. Zerbo said. 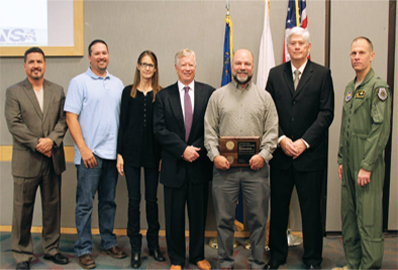 The Nevada National Security Site (NNSS)’s Mike Kinney recently received an Award of Distinction from Centerra Group’s Board of Directors for assisting Centerra-Nevada in revising their employee safety program. 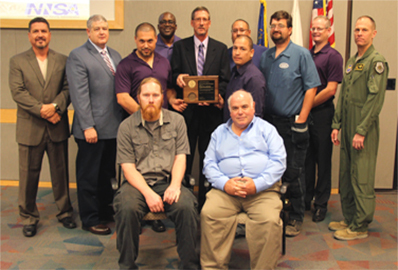 By implementing his suggestions, Centerra-Nevada was honored with the Department of Energy’s Voluntary Protection Program (DOE VPP)’s STAR certification. 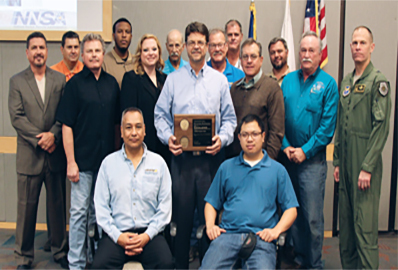 Contractors whose programs meet the requirements for outstanding safety and health programs receive STAR recognition, the highest achievement level. “We are now VPP STAR compliant and continue as a VPP STAR participant,” said Centerra-Nevada’s General Manager Martin Glasser. “I want to compliment Marty and his leadership team for having the courage to provide their employees with an ‘open book’ to enhance their collective safety programs. In turn, the complete Centerra-Nevada team is to be congratulated on their willingness to embrace change and take ownership of the associated initiatives. I have been involved with the DOE VPP Initiative since 1996, and I am honored to have the opportunity to work with Centerra-Nevada as they continue their DOE VPP journey. 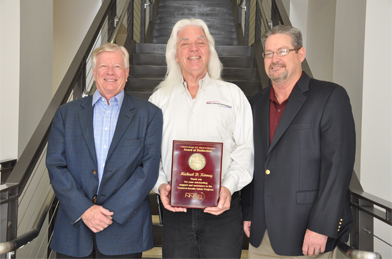 I was very surprised, and humbled, to be the recipient of such prestigious recognition from Marty and the Centerra Group,” said Kinney, manager of the Occupational Safety & Health division in National Security Technologies (NSTec)’s Mission Assurance & Safety directorate. “Safety is at the forefront of our culture, and Mike is a passionate and energetic team leader in promoting the Site’s safety programs. We are proud that Mike applied that same passion and energy to where Centerra-Nevada earned their VPP STAR recognition. 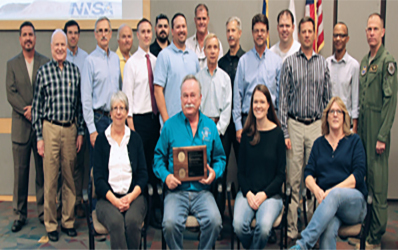 Congratulations, Mike,” said NSTec President Jim Holt. 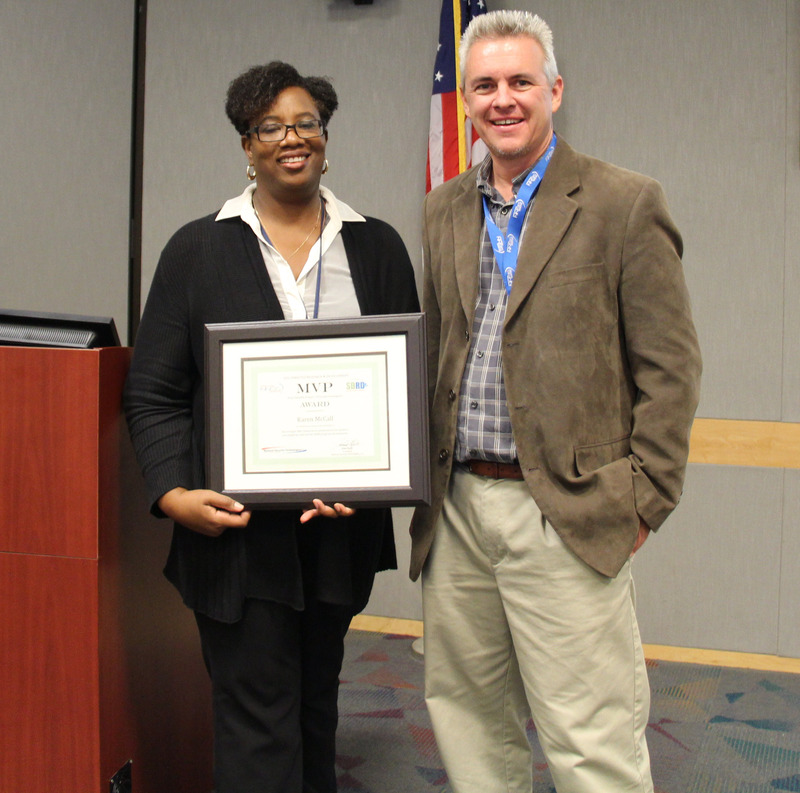 At NSTec, Kinney has been instrumental in helping the company retain its own DOE VPP STAR certification for seven consecutive years. Another safety improvement was implementing a ground guide. “If two people are in a vehicle, one has to get out and guide while the driver backs up so that we don’t hit anything or anyone,” said Glasser. Centerra employees also came up with their company’s safety mascot, Boris the Bull, as a fun way to continue the safety reminders. Another day, another milestone for the U.S. Department of Energy (DOE) Environmental Management (EM) program. After more than 20 years of hard work and cross-agency collaboration, remediation efforts of Double Tracks have been completed to meet current U.S. Air Force (USAF) land-use requirements. 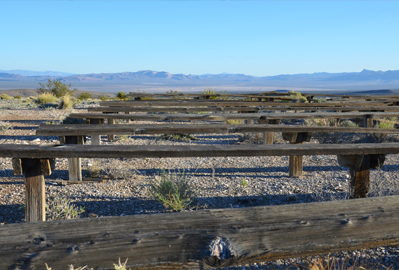 Double Tracks is the site of a 1963 plutonium dispersion test and is located north of the Nevada National Security Site (NNSS) on the Nevada Test and Training Range (NTTR). Completion of environmental characterization and remediation at Double Tracks marks the first time a plutonium dispersion site on the NTTR has reached the completion phase outlined in the legally binding Federal Facility Agreement and Consent Order (FFACO). This completion does not mean the sites are releasable for public use; however, it does allow for a less restrictive management of the sites. The process began in 1994 after initial investigations of the Double Tracks site were conducted. In 1996, contaminated soil and debris within the identified area were removed and safely disposed and the area was revegetated. Because of the complexity and the multiple stakeholders involved, the project was tabled and restarted in 2012. Due to the time lag, and to ensure that data was collected using the most modern techniques available, additional investigations were planned to establish current conditions of the site. The collaborative effort continued and, in 2014, additional data was collected in order to determine whether site completion objectives had been achieved. The USAF also conducted their own independent samples and data collection. Based on these investigations and cleanup efforts, it was determined that further corrective actions were not required and remediation was considered complete under the FFACO. However, if the USAF mission and/or land use changes, site conditions may need to be reassessed. Not only does the transition to completion phase validate more than 20 years of data, but it also solidifies the working relationship between the DOE and its key stakeholders. "The closure of the FFACO is an important step in continuing the cleanup efforts of the DOE EM program, but it couldn't happen without great working relationships with the Nevada Division of Environmental Protection and the U.S. Air Force,” said Tiffany Lantow, DOE NFO Soils Activity Lead. “Those relationships make it possible to discuss options and information and work together towards a single goal,” she added. 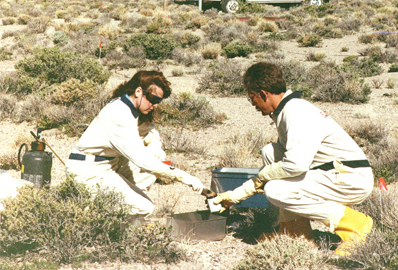 DOE is responsible for the remediation of sites with legacy contamination resulting from historic nuclear research and testing at the NNSS and NTTR, including the Tonopah Test Range. The completion of this environmental restoration mission is governed by the FFACO, a legally binding agreement between the DOE, State of Nevada, and the U.S. Department of Defense, which establishes a framework for identifying, prioritizing, investigation, remediating and monitoring the contaminated sites. For more information on the different NFO EM programs, visit www.nnss.gov/pages/programs/em/Environmental.html. Operation Roller Coaster, conducted in 1963, was a joint exercise between the U.S. Department of Defense, Atomic Energy Commission, and the United Kingdom, on USAF land at the NTTR. The project consisted of four conventional explosive detonations of nuclear devices designed to determine if nuclear weapons could be accidentally set off and produce a nuclear yield. The devices were detonated at four sites: Double Tracks and Clean Slate I, II, and III, and proved that accidental yield-producing nuclear detonations would not occur. However, as a result of the experiments, the soil in the area was contaminated. For more information on Double Tracks and other historical Plutonium Dispersal Tests, visit www.nnss.gov/docs/fact_sheets/DOENV_1046.pdf. 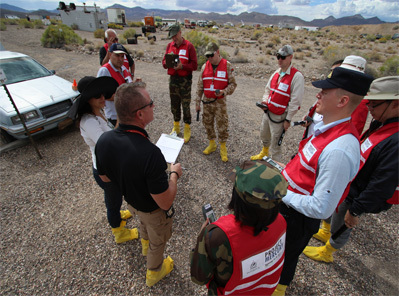 First responders from 11 nations took part in the first international emergency response training at the Nevada National Security Site (NNSS). The training is offered by the NNSS Counter-Terrorism Operations Support program and is one of the most realistic training programs in the world, designed to help emergency personnel to respond to a nuclear or radiological emergency such as a “dirty bomb” or other terrorist act. Nearly 190,000 first responders from the United States have completed the training. CTOS recently offered a new course, organized with INTERPOL, designed for international first responders. First responders are rightfully credited with being the people running towards an emergency when everyone else is running from it. They face daunting challenges during an emergency – trying to safeguard the area, respond to victims, and prevent additional injuries by stopping future incidents. During the course, crews learn to locate hidden sources of radiation, assess the threat, and to treat victims who may have been exposed. It’s training that no one hopes to ever need, but it’s vital for first responders to be prepared. INTERPOL organized the training, bringing together 35 first responders from: Armenia, Azerbaijan, Belarus, Georgia, Kazakhstan, Kyrgyzstan, Moldova, Tajikistan, Turkmenistan, Ukraine and Uzbekistan. INTERPOL’s primary objective was to prepare the participants to prevent or respond to terrorist use of radiological or nuclear weapons. The course also addressed the need to develop a methodology for conducting effective, intelligence-driven and prevention-orientated investigations into incidents involving nuclear and other radioactive sources. The NNSS provides the most realistic environment for this type of training. From 1951 to 1992, the U.S. tested nuclear weapons at the NNSS. Today, the 1,360-square-mile Site provides an environment where background radiation is sufficient to help first responders learn how to detect radiation, but under lower levels of exposure than doses found in a traditional chest X-ray or cross-country airline flight. The Nevada National Security Site (NNSS) awarded Karen McCall, program manager for the Unmanned Aerial Systems (UAS) program at the NNSS, the “Most Valuable Principal Investigator” award. The award is given by the NNSS’s Site-Directed Research and Development division to acknowledge a person or project that has made a profound contribution to the Site’s mission. NNSS scientists, engineers, and technicians gather annually for the Site-Directed Research and Development meeting, a way for the agency’s top scientists to hear from their peers on the advancements in physics, nuclear science, engineering, and global security. Bender presented the top award to McCall. McCall leads a team that has developed the UAS program for the NNSS. The program is using unmanned aerial vehicles to research how to best detect radiological, nuclear, and chemical agents. The program launched just two years ago and today boasts six vehicles with a seventh arriving soon. “Two years ago, we did not have a footprint in this industry at all. We wanted it – we needed it – but we didn’t have it. The fact that we have platforms today, that we have made the investments in the vehicles and that we’re working on the sensor technology now, is remarkable progress,” McCall said. Each year, SDRD solicits project proposals for funding consideration from within the NNSS. The UAS program was selected for funding two years ago. The program marries the emerging technology of unmanned aerial vehicles with the sophisticated science that the NNSS uses to detect radiological, nuclear, and chemical agents. Using sensors developed by the NNSS as well as those commercially available, McCall and her team are working to integrate those into the unmanned vehicles. That integration will allow the vehicles to be used in a variety of missions, from helping to secure the NNSS itself to emergency response. The program exemplifies what the SDRD program is designed to do: to be the place where scientists, engineers and technicians come together to talk about what is possible. McCall talks about a conversation that she had with SDRD program manager Howard Bender two years ago about the uses of unmanned vehicles. Twenty-one NNSS volunteers spent the morning at Three Square packing after-school meals for school children and bagging produce for families. Three Square is Southern Nevada’s only food bank and relies heavily on volunteers to help pack and distribute about 45 million pounds of food each year to more than 300,000 people. In just three hours, our volunteers (and others from the community) packed 1,912 after-school meals and bagged 6,631 pounds of produce. Many thanks to the following volunteers for taking the time to make a difference: Tania Martinez, Brian Brown, Varita King, Kayla Buchanan, Pam Handor, Desiree Hanache, Thomas Misiak, Paula Birch, Marianne Robbins, LeeRay Robbins, Sue Otis, Larry Otis, Sherry Garelick, Joann Jackson-Bass, Jerry Griggs, Norma Griggs, Savannah Mills, Preston Johnson, Tammy Platte, Larry Platte and Kirsten Kellogg. Between 1965 and 1971, 10 underground nuclear tests were conducted at Frenchman Flat on the Nevada National Security Site (NNSS), each providing valuable data in a few spectacular seconds. In the decades to follow, NNSS scientists worked to understand the effects of those tests on the site’s groundwater. Their studies have confirmed that the contamination from nuclear testing in groundwater at Frenchman Flat poses no risk to the public, and in a milestone achievement for the NNSS groundwater characterization program, the area has been approved by the State of Nevada Division of Environmental Protection to transition to long-term monitoring. Long-term monitoring is the end goal of the strategy outlined in the Federal Facility Agreement and Consent Order (FFACO) for the five groundwater investigation areas at the NNSS. Frenchman Flat is the first to enter into this important final stage. 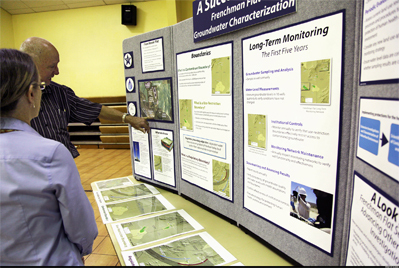 While entering this stage signifies a thorough understanding of the groundwater flow system, routine monitoring at Frenchman Flat will continue, and results will continue to be reported annually in a publicly-released report. The success at Frenchman Flat follows over twenty years of hard work and continuous study carried out by multiple organizations, including two external peer reviews. During this time, multiple groundwater characterization wells were drilled, three-dimensional computer models were developed and refined, and boundaries for restricted access were established. 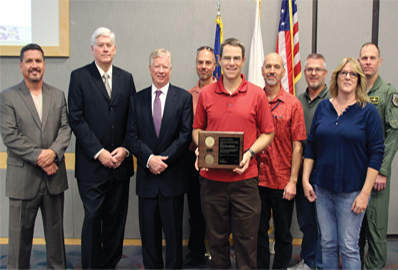 “The NNSS is one of the most studied locations in the world, and this achievement is a testament to the teamwork between all organizations involved,” said Bill Wilborn, manager of NNSS groundwater characterization for the Department of Energy. In preparation to enter the long-term monitoring stage, scientists prepared a report detailing the studies conducted at Frenchman Flat. Their findings include that contaminated groundwater is not expected to leave the Frenchman Flat basin, and that radionuclides in the groundwater will travel less than a mile in 1,000 years. “The groundwater flow system and potential for contaminant movement is well understood, to the point that protection of the public is ensured,” said Wilborn. Transitioning Frenchman Flat to long-term monitoring provided NNSS scientists and staff with an invaluable experience for understanding the necessary balance of modeling, monitoring, and restricted access that is protective of the public and the environment. It also set the stage for other NNSS groundwater investigation areas. “Although the regulatory strategy is the same, each will have unique challenges due to the varying subsurface environments,” said Wilborn. Groundwater studies at the NNSS will continue with the goal of transitioning all areas of the NNSS to the long-term monitoring stage. Click here to learn more about groundwater characterization at the NNSS. Nevada National Security Site (NNSS) Fire and Rescue (F&R) personnel who respond to potential hazardous materials incidents at the Site have a new friend. Although missions at the NNSS are carried out with the utmost safety in mind, the use of chemicals and radioactive materials by nature have the potential for danger. As such, F&R must remain at the ready at all times for various types of hazardous events. For that reason, the department has purchased a new handheld chemical analyzer, which gives first responders new and advanced technology to determine what a chemical is in order to best approach life safety and mitigation. 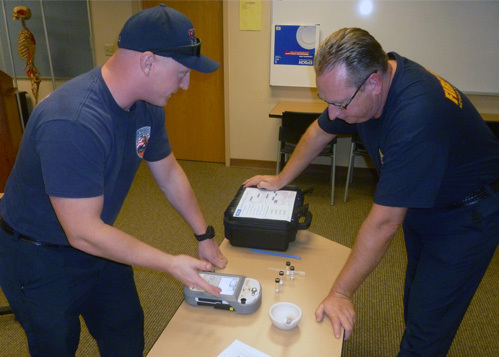 The new device was demonstrated last week at NNSS Fire Station 1 for officials from the U.S. Air Force, the Nevada Division of Environmental Protection, Nye County Haz-Mat and Nevada Field Office (NFO) managers. “This analyzer clearly enables us to make better decisions about the next steps” in a response, said Scott Wade, assistant manager for Environmental Management for NFO. Response personnel rolling up on an event with the potential for hazardous materials already use a variety of monitors and sensors that detect whether a radiological threat is present. With the new device, first responders don protective equipment and gather a sample that is then inserted into the chemical handheld analyzer for analysis. The device has a library that contains identifying characteristics of more than 10,000 chemicals. The device uses infrared and other technologies to determine the type of chemical. Responders can then decide what their next course of action should be. “This device dials us in and enables us to set up a plan for what we need to do,” said NNSS Assistant Chief Dan Crays, who led the demonstration. Life safety is always the priority, but responders can determine whether to work around the chemical or whether other protective measures are required. Crays said NNSS F&R also works closely with municipal and county fire agencies in hazardous materials response. The handheld chemical analyzer assists in ensuring continuity so agencies can work together to deal with the incident. “This takes all the guess work out it,” Crays said, adding that NNSS F&R also uses the same forms and charts as other agencies that identify and track hazardous materials response procedures step-by-step. The NNSS F&R department consists of more than 70 firefighting and paramedic personnel who reside in two fire stations. They provide service to the 1,375-square-mile NNSS 24/7, ensuring the safety of the Site’s 3,000-plus workers. Additionally, F&R provides mutual aid to areas of Nye County such as Armagosa Valley and Beatty. Such a response occurred last October when NNSS F&R joined Nye County Haz-Mat responders at a radioactive waste plant fire in Beatty. Nye County used a similar device as the handheld chemical analyzer. NNSS Fire Chief John Gamby said his department’s Hazardous Materials team worked well during the response due to the extensive collaborations that occur year-round. “We partner very well with other agencies around the region and this new handheld chemical analyzer improves our overall ability to integrate effectively with other emergency responders,” Gamby said. Twelve NNSS F&R personnel already are trained in the use of the device and the rest of the department soon will be trained in its use. Counting sheep may be a good way to fall asleep, unless you’re a biologist. For Derek Hall and his team of biologists here at the Nevada National Security Site, counting deer is keeping them up at night. The team is spending nights at the NNSS counting mule deer as part of the annual deer survey. This survey is one of many conducted throughout the year to help biologists gauge the populations of several game species, including desert bighorn sheep, antelope, wild horses, and Hall’s favorite, mountain lions. “Being able to see those in the wild is really cool,” Hall said. The surveys give biologists a glimpse into the ecosystem of the Site. Throughout the year, a blend of field surveys, motion-activated cameras, and aerial tours help to count the large animal species that live at the Site. The efforts are part of the NNSS’s environmental stewardship program. The studies help to show that the national security work at the Site isn’t causing harm to the game. Their studies seem to bear that out. Population of antelope have swelled in recent years, as has the wild horse population. An additional mountain lion was also spotted this year. Hall and his team will spend a few weeks this month studying the mule deer population. 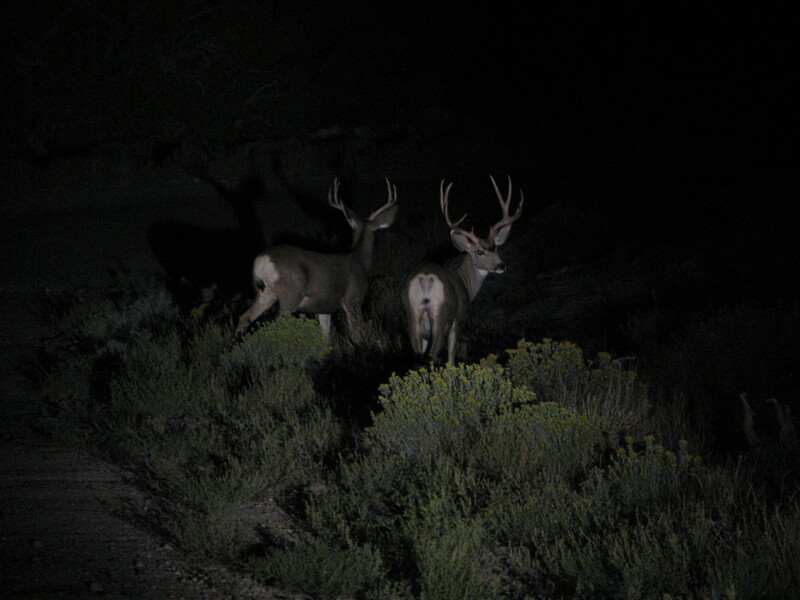 Driving the roads of the Site at night, they search out the mule deer that they know wander the land. One night recently, it wasn’t the eyes of a mule deer staring back at him. “We looked up and there was a mountain lion,” Hall said. It wasn’t the only sighting. During this month’s surveys, Hall and his team saw mountain lions two nights in a row. “Seeing a lion two nights in a row is really rare.” Another reason to keep Hall up at night! Nevada National Security Site, Livermore Operations Office, scientists have completed building, qualifying and preparing new Opacity Spectrometers, which were included in the first Opacity shot at the National Ignition Facility (NIF) on Friday, Sept. 9. The NNSS team fielded the Opacity Spectrometer, or OpSpec, devices as part of a five-laboratory collaboration established in 2015 between Los Alamos National Laboratory (LANL), Lawrence Livermore National Laboratory (LLNL), NNSS, Sandia National Laboratory (SNL) and the Laboratory for Laser Energetics (LLE) in Rochester. Developing an opacity platform at the NIF was aimed at independently verifying ongoing opacity measurements performed at the Z-Facility at SNL. 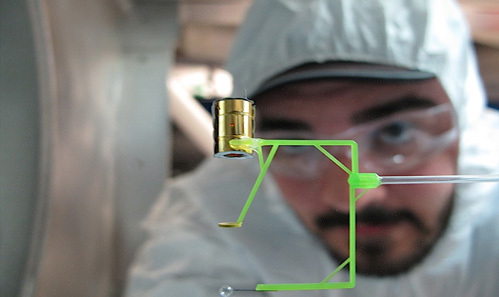 Previous measurements disagree with current models, and NIF is the best facility to attempt to reproduce the results. OpSpec has collected the first data set on the NIF using the fully integrated opacity platform. The data return is a key deliverable for completion of the FY16 High-Z Opacity Assessment milestone. OpSpec uses a potassium acid phthalate (KAP) Bragg crystal dispersing element and either film or image plates as detector media to cover an energy range from 500 – 2000 electron volts (eV). In the experiment, iron samples are heated with X-rays from a laser-heated metal cylinder (hohlraum) to bring the sample to the density and temperature achieved at the Sandia Z-Facility. A separate backlighting X-ray flash is generated by a laser heated plastic capsule, which is used to record an absorption spectrum through the sample onto an X-ray spectrometer. The NNSS scientists also are involved in opacity platform development shot support and data analysis. The team helped to design, develop and understand the broadband X-ray backlighter source. In addition, they provide broadband soft X-ray spectrometer (Dante) data analysis, vital to determining the temperature of the hohlraum and sample, along with analysis of data collected with X-ray spectrometers and imagers that provide information on the X-ray source size, duration and brightness.